Buy HT12E RF Encoder Online at LOW COST on www.dnatechindia.com. Delivery all over India. The 212 decoders are a series of CMOS LSIs for remote control system applications. They are paired with Holtek s212 series of encoders (refer to the encoder/decoder cross reference table). For proper operation, a pair of encoder/decoder with the same number of addresses and data format should be chosen. The decoders receive serial addresses and data from a programmed 212 series of encoders that are transmitted by a carrier using an RF or an IR transmission medium. They compare the serial input data three times continuously with their local addresses. If no error or unmatched codes are found, the input data codes are decoded and then transferred to the output pins. The VT pin also goes high to indicate a valid transmission. The 212 series of decoders are capable of decoding information’s that consist of N bits of address and 12 N bits of data. 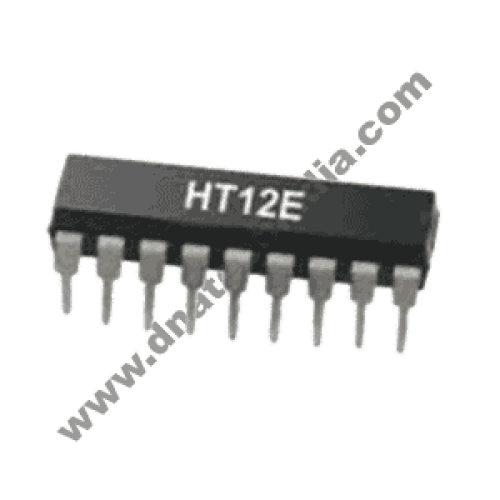 Of this series, the HT12D is arranged to provide 8 address bits and 4 data bits, and HT12E is used to decode 12 bits of address information. 4 Channel Wireless RF Remote with TTL OutputThis is a 433 MHz four chanel wireless RF Remote with TT..